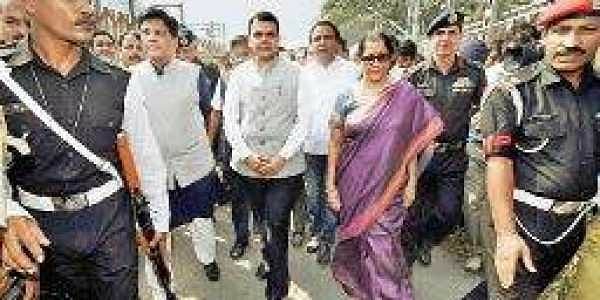 NEW DELHI/MUMBAI: Defence minister Nirmala Sitharaman’s announcement that the Army will be involved in building a foot overbridge at Mumbai’s Elphinstone Road station has provoked massive criticism from the military fraternity. Soon after the announcement, top officials from the Bombay Engineering Group — popularly known as Bombay Sappers in the Army circle — carried out a reconnaissance of the site. They are expected to submit a project report to the state government and the Railways in the next few days. However, the decision to involve the Army for the construction work of the foot overbridge has not only attracted criticism the opposition leaders but also from veteran army personnel. Lt Gen Mohinder Puri, former deputy chief of Army Staff, who fought in the Kargil War, was amused with the decision. “Army resources should be used judicially. Unless there is an emergency, I don’t appreciate idea of the using the Army in civilian works,” he said. Maj Gen G D Bakshi (retd) came out more strongly by saying that the Army should never be used in civil works unless there is a national disaster or emergency, for which there is the National Disaster Response Force. “The Army is an instrument to be used as a last resort. It has always come to the fore, even before being asked, during natural calamities. But here when we have the complete machinery of the Railways and the state, using the Army should not have been there at all,” he said. The debate was triggered by Punjab chief minister Amarinder Singh, who compared the move with Lt Gen B M Kaul asking soldiers of the 4th Division to build houses before the 1962 war with China. “The Army’s job is to train for war and protect the country’s borders, not to build bridges and clean the roads,” said Amarinder. He warned that the Army would end up suffering lowering of its status if the defence ministry does not withdraw its decision to use it for building civilian bridges in Mumbai. However, a senior BJP leader defending the government’s decision said, “When the stampede took place on Sepetember 29, (railway minister) Piyush Goyal, who was in Mumbai called for meetings with senior Railway officials. They came to know that the project of constructing another bridge at Elphinstone Road station was entangled in a lengthy tendering process. “We also found out that the process could have taken another year to complete. Someone mentioned army’s techniques for building bridges quickly which led to the idea that was never tried before,” said the senior BJP official. In 2015, the Army built a floating bridge on the Yamuna for Sri Sri Ravi Shankar’s Art of Living event in Delhi that was controversial because of environmental violations. In 2010, when Delhi hosted the Commonwealth Games, the Army rebuilt a bridge that had crashed near a key stadium.